STOUGHTON, Mass. 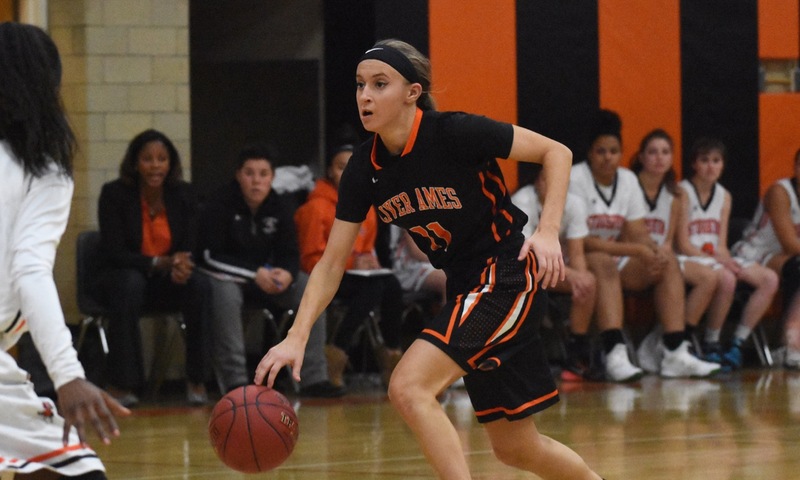 – Oliver Ames came into the season with a young squad and head coach Laney Clement-Holbrook has used the metaphor of a jigsaw puzzle to explain to the Tigers how they are all going to need to put together the pieces to be successful. Those pieces formed a nice picture on day one. Every OA player got the chance to play and the Tigers got 22 points off the bench, outscoring Stoughton’s bench 22-8, to open the season with a 46-33 road victory over the Black Knights. It was a rough night for the Stoughton offense, as the Black Knights struggled to find the range and shot only 3-of-34 in the first half. Defense kept the home team in the game, and allowed Stoughton to get as close as seven points in the fourth quarter. The Black Knights scored the opening five points of the game, as sophomore Sydnee Hyacinthe buried a pull-up three and scored off a steal. It would turn out to be her only points of the night. It took OA four minutes to make a shot from the field, but junior Meg Holleran’s three gave the Tigers a one-point lead. Sadie Homer (eight points) scored on a fast break off a Tate Hadges assist to put Stoughton ahead 11-10 after one quarter. In the second, Stoughton’s offense continued to struggle. Hanna Holden knocked down a lefty shot in traffic for the lone basket of the quarter, as the Black Knights managed just three points. “We were settling for the three early and I was saying that we need to get into attack mode because we have kids that can get to the rim,” said Steele Jordan. OA got a much-needed offensive spark from the bench. 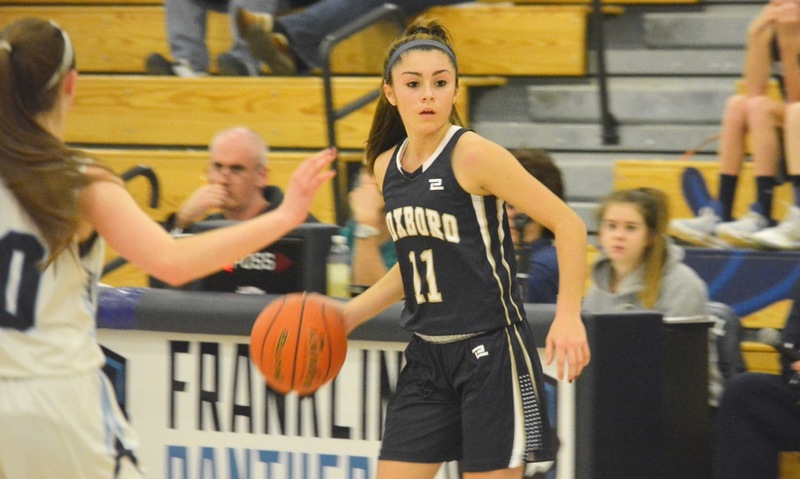 Ally Scolnick (team-high 11 points) drilled a corner three off a Holleran inbounds pass and freshman guard Caroline Peper added one from the corner as well. Freshman Hailey Bourne followed up a missed layup on the break for her first career points and then Peper got a pass from Homer and went with a reverse for a 23-13 lead at the half. Offense was a struggle for both teams, but it got even tougher to score in the third with the two teams combining for just 13 points. Aliyah Wright scored her lone basket of the night on a drive, junior Heather Maddalena knocked down a jumper and senior Lindsay McDonald got her first basket of the night. That was it for Stoughton. Homer scored on the break, Erin Holmberg had a free throw and got her only basket on a transition layup, and Caroline Flynn (13 rebounds) hit a jumper. That was it for OA. The Tigers led by 11 heading into the fourth, but the Black Knights were still in the game. Lexi Baptista (10 rebounds) started the fourth with a short jumper and then McDonald grabbed an offensive rebound and finished plus a foul. McDonald caught fire in the fourth, scoring 11 of her game-high 14 points. She also had 17 rebounds on the night. Twice McDonald got the Black Knights within seven points, at 33-26 and 38-31, but each time the Tigers responded. Scolnick scored six points in the fourth, Holleran (nine rebounds) had one of her three assists to set up sophomore Jessica Erlich. Flynn capped the game with a transition layup to extend the lead to 13 points. “We talked about defense, talked about rebounding, and talked about boxing out and I think we did those three things consistently tonight,” said Clement-Holbrook. Oliver Ames (1-0) will try to make it two wins in a row on Friday night with a trip to Taunton. Stoughton (0-1) will open Davenport division play on Friday at North Attleboro.